On Easter Monday, 24th April 1916, members of the Irish Citizen Army and the Irish Volunteers, under the command of Pádraig Pearse and James Connolly, occupied the General Post Office in Sackville Street, Dublin. From the portico of the iconic building, an independent Irish Republic was declared. For seven days, this newly proclaimed republic fought a week-long bloody engagement with British Crown Forces as part of the 1916 Rising that would see hundreds die and Dublin city reduced to rubble after an intensive military bombardment. 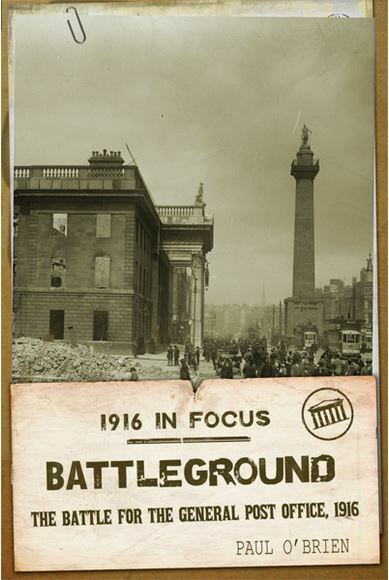 Battleground – The Battle for the General Post Office, 1916 is a detailed account of the actions in the area of operations in and around the General Post Office. The building served as the General Headquarters of the Republican Army and witnessed some of the fiercest fighting of Easter Week as the beleaguered garrison fought against overwhelming odds. The Rising was quickly and brutally suppressed, but the memory of the heroism depicted that week and of the executions that followed changed Irish history forever.